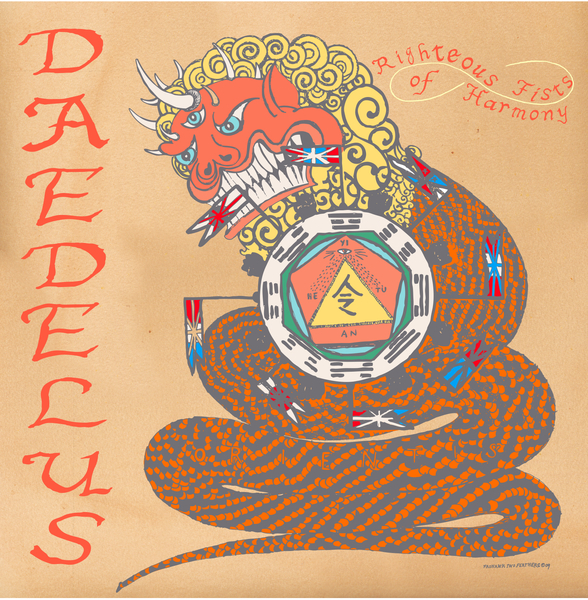 The ridiculously talented Daedelus offers his latest exploits for Flying Lotus's Brainfeeder label. In fine style, Daedelus constructs an unpredictable and winding narrative starting with the mini-epic 'An Armada Approaches', swelling from craftily harmonised beginnings to become a scene of surging strings and pitching hiphop rhythms. 'Tidal Waves Uprising' follows with impossibly strummed guitar strings before arriving at the yachting synth vistas of 'The Open Hand Avows. 'Order Of The Golden Dawn' offers a lush 4-minutes of tropicalia more in tune with his Long Lost project, carried through with the breathy vocals and Latin handclaps of 'Succumbing To' and the echoic chamber pop of 'Stampede Me'. This is a lush trip that we'd recommend to any fans of his many, many projects. Brilliant.